Located in Miller's Tavern, Virginia 25 miles east of Richmond, Virginia on Route 360 towards Tappahannock is the Miller's Tavern Log Yard and Dry Kilns. 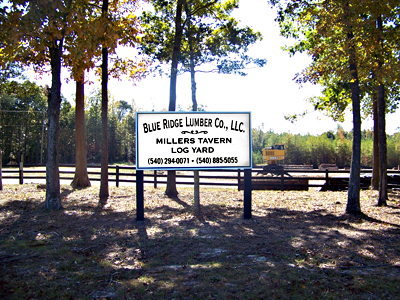 This is Blue Ridge Lumber's newest log yard which opened on September 1, 2009 to better serve the counties of the eastern portion of the Commonwealth. The Miller's Tavern Log Yard and Dry Kilns is a grade yard which accepts first and second cuts that are 14" in diameter and larger from the following Appalachian hardwood species: White Oak, Black Oak, Northern Red Oak, Hard and Soft Maple, Cherry, Poplar, Ash, Walnut and Hickory. 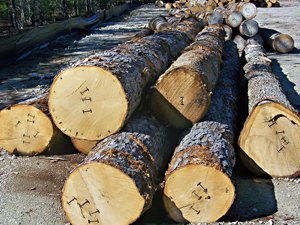 Logs are received from 8:00 am to 4:00 pm Monday thru Friday. Payment is issued on Friday for all logs received by 4:00 pm on Wednesday. Please contact Chuck Kelly with any questions.